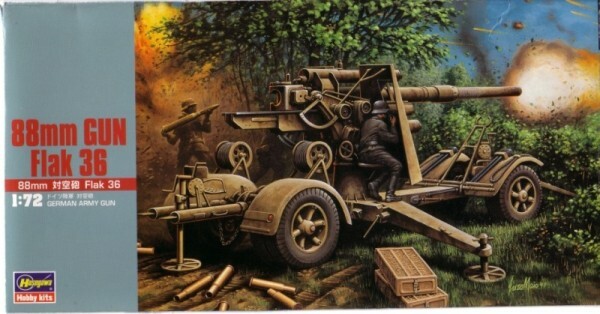 Every once in a while, I get the urge to build some artillery, even though I don't know much about the subject. 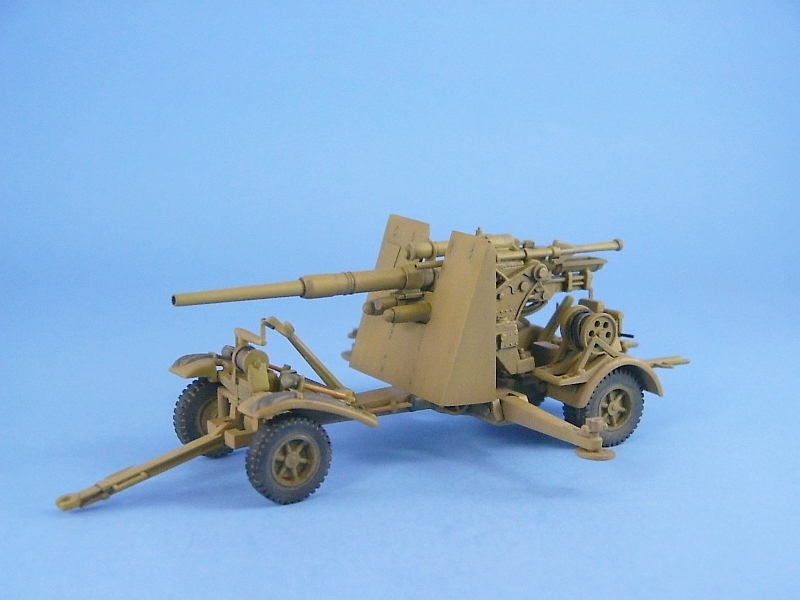 I find the German 88mm Flak guns quite appealing and I decided I'd try this version from Hasegawa. In the box are 98 parts molded in light grey plastic spread over five sprues. From what I can gather from various sources, this kit actually is a Flak 18 with the later three piece barrel and not a Flak 36. Apparently a proper Flak 36 would have the strengthened trailer with two wheels on each of the axles as opposed to the Flak 18 trailer with one wheel per front axle and two per rear axle as found in this kit. 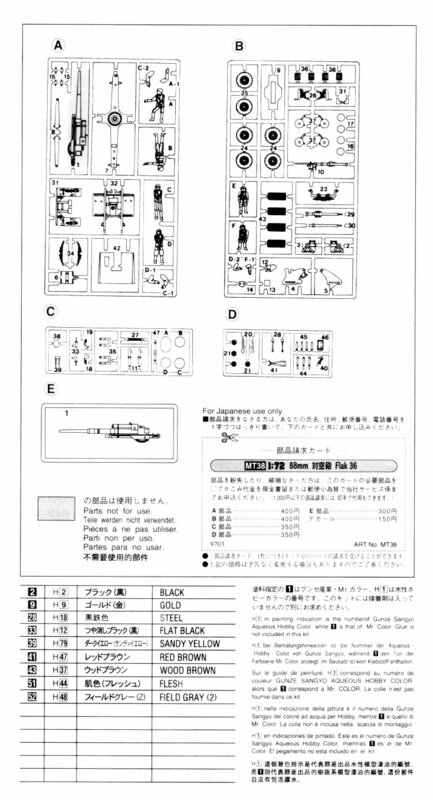 So it appears Hasegawa have used the molds for their previously released Flak 18, complete with the old Flak 18 one piece gun barrel (part D1), and added a completely new sprue for the different barrel (part E1), then remarketed the kit as a Flak 36. The original molds for the Flak 18, on sprues A through D, are starting to show their age. There are significant seams to remove from some of the parts. The wheels are particularly bad. They were molded slightly out of alignment and the removal of the seam down the middle of the tire also removed a fair amount of the tread detail. On the plus side the new gun barrel is excellent and perfectly molded. The decals consist of a set of generic markings for a variety of German units plus some kill stripes for the barrel. I did not use any of them but I suspect they will be your typical Hasegawa fare - a little on the thick side but will settle down well with some Microsol applied. I was in a quandary on how to build this kit. I really didn't want it in firing position with the limbers separate as it would be too many loose parts lying around for my liking and I didn't want it in towed form because I had no plans to build a tow vehicle to attach it to. After browsing the web I found a few pictures showing the gun being used while still on its wheels so I decided to go this route with the build. Although detail is not too bad the kit definitely can use some simple improvements to make it better. I started by building the frame (parts 7 & 8) and then covered over the hollow undersides of part 7 with some thin plastic sheet. I added small discs over the hinge points for the folding legs punched from some thin plastic sheet. The hand cranks (part 26) were thinned and I added handles using very thin plastic rod. Next was a pair of scratchbuilt tow hooks to go under the rear ends of the rear limber (part 32). Then came the fun part, drilling holes wherever I could. First was the muzzle end of the gun and the two ends of the sights. I added holes to the seat and drilled out the holes on the frames holding the wire spools (part 35). While I was at it I decided to try something different - detailing the wire spools. I discarded the parts for the molded on cable (part 36) drilled out the ends of the spools, added a tube between the two sides and then wound some copper wire over the tube to replicated the cable. There are a couple of braces between the shield and the gun frame which I added with some plastic rod. The handles for the sledge hammers (part D28) and shovels (part D20) were thinned. I only mounted one of the shovels, putting the other into the spares box for a future build. 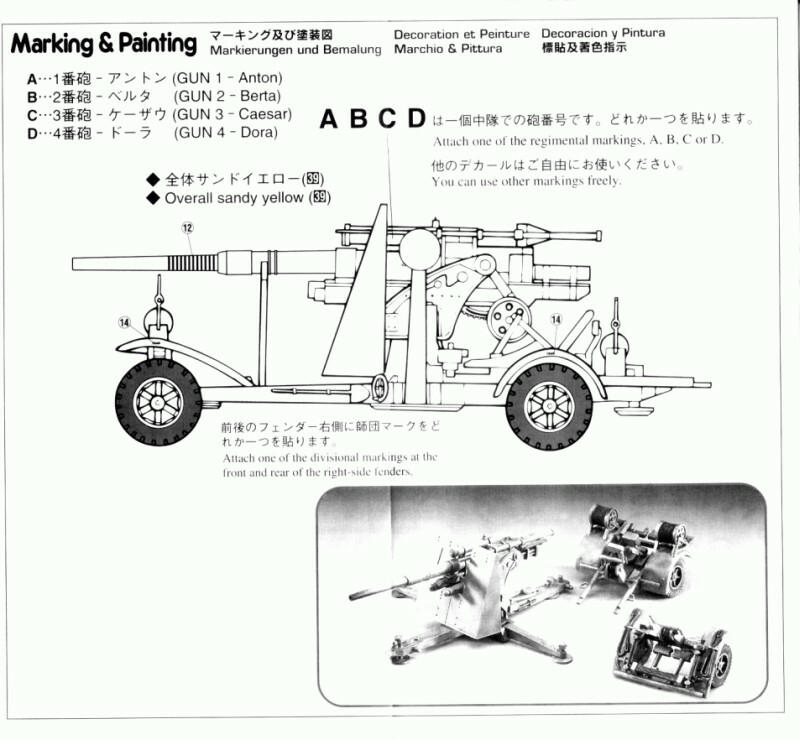 The kit was made in two sub-assemblies: the gun and the chassis. To facilitate painting I used the convenient hole in the top of the gun pedestal, which was ideal for inserting a handle, and I drilled a hole in the bottom of the gun mount to give me a spot to insert another handle. Once everything was painted and the two sub-assemblies joined, I added my last detail item, a section of chain draped over the frame of the rear limber. This kit still makes up into a nice model, but what you get is a 3-piece barrel version of the Flak 18 gun, and not a true Flak 36. 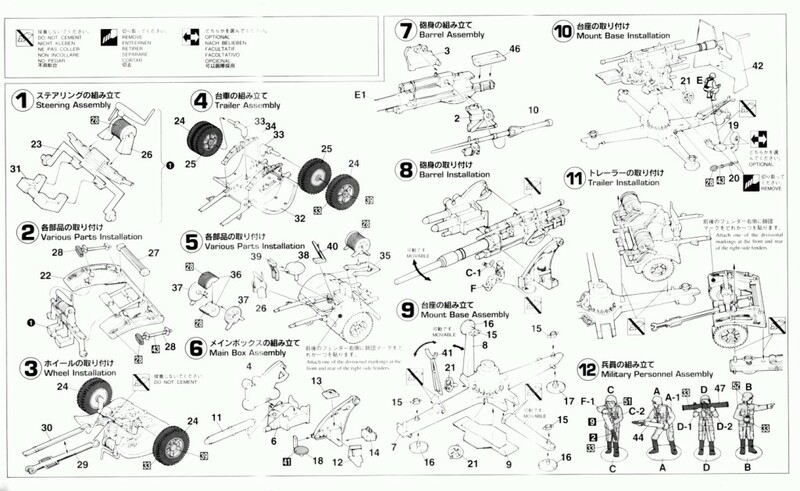 With the newer Revell 88mm Flak 36 kit in 2010 the Hasegawa kit has been eclipsed. The old molds dating back to the around the 1970's shows compromises and shortcuts that limit the usefulness of this kit for the basis of a good display model. The modeller will need to make extensive changes to the base kit, or cross kit it with another Flak 36 kit, to increase the detail. What you get is a kit that still makes up into an attractive model with detail similar to what you'd expect for a modern wargaming/quick build kit. 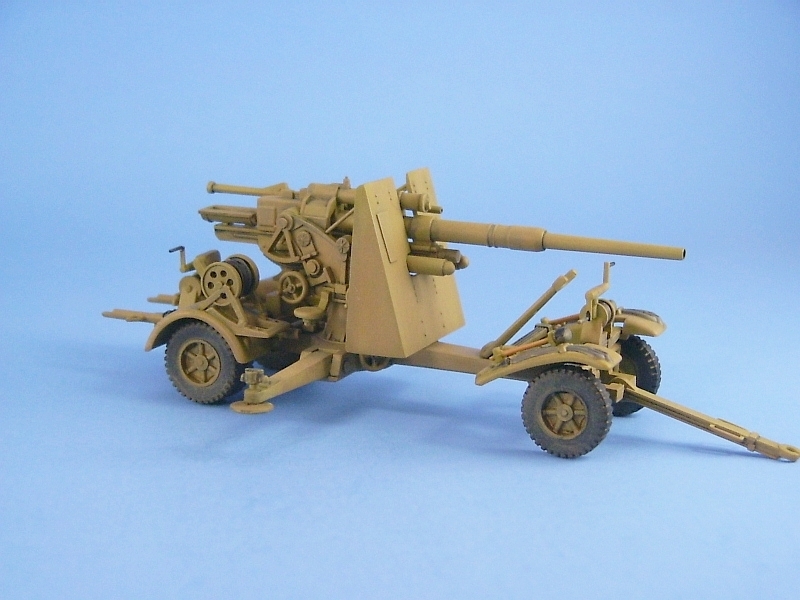 Unfortunately all that Hasegawa has done is include a new 3-piece barrel to their old release of the Flak 18 gun. If you want a true Flak 36 in injected plastic then the Revell release is the best bet. 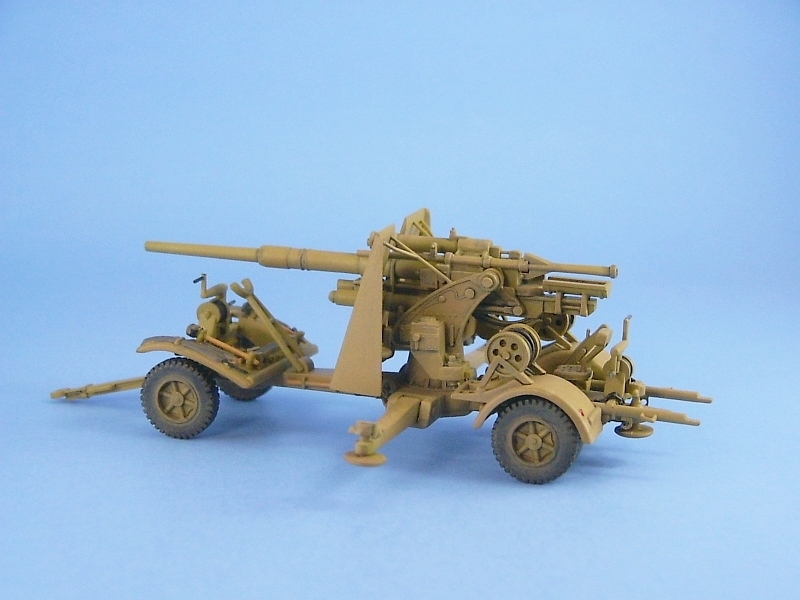 A review of the Revell 8.8cm Flak 36 can be found here.